One of the great traditions of British cycling was "club riding": small, local groups of cyclists organized into clubs for regular sporting or recreational rides. These could comprise long or short tours, day trips, time trials or roadracing. The emphasis in many clubs was more camaraderie than competitive but it was not always a pub crawl. Many group rides were multi-day affairs and as varied as the British countryside. The sheer variety of club rides and riders demanded a versatile and popularly priced mount, one that was lightweight, but with more relaxed frame angles than a pure racing type, as well as mudguards and lighting equipment for all-year, all-weather use. 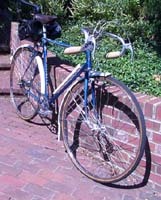 By the 1930s, most cycle manufacturers offered a specific range of "club" cycles ranging from simple derivations of the steel-framed, cable-braked "sports light roadsters" to the most sophisticated machines of their day with light steel tubing, celluloid mudguards, Sturmey Archer hub gears, alloy fitments and 26" x 1 1/4" (597 mm) lightweight steel wheels, quick release wing nut hubs and high pressure (70 psi) tires. Club models figured prominently in the post-war revival of the British cycle industry, both for the home market and, more importantly, the export trade, specifically to the United States. "Export or Die" was the credo of British industry at the time and manufacturers were compelled to export a certain proportion of their yearly production whilst high domestic purchase taxes (as high as 33 per cent) discouraged domestic consumption and ensured British cycles a newfound place in the American market then just discovering adult sport cycling. Although the "sports" roadsters dominated, the club models found an enthusiastic reception as nothing like them had ever been offered before in the United States. 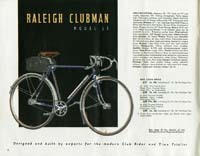 The Clubman's roots go back to March 1946 with the introduction of Raleigh's initial post-war range including the Lenton Sports, no. 25, also produced as the Rudge Aero and Humber Beeston Sports). This in itself was an improved version of the briefly offered Lenton Sports, no. 44, of 1940. The post-war version "designed to appeal to the clubman tourist in particular, as well as to all who can appreciate a reliable, attractive-looking and responsive mount at a reasonable price" [£15. 3 s. 8 d.] (Cycling) featured a 21" Reynolds 531 frame with 71° deg head and seat angles, a newly designed fork with solid ends and a new handlebar stem. It also introduced the striking Polychromatic Olive Green livery. This model, however, proved short-lived and was withdrawn from production in spring 1947. Raleigh's 1948 range included a new series of club machines: Raleigh Lenton Clubman no. 25, Rudge Aero Clubman no. 125 and Humber Beeston Clubman model 325. The only differences between the brands were the forks, finishes (Polychromatic Olive for Raleigh, Lustre Orange for Rudge and Polychromatic Blue for Humber) and transfers. The "new" model employed essentially the same frame as the Lenton Sports but in a 22" size and with Dunlop high pressure Endrick rims and tires. One of the models on view that attracted special special attention was the new Lenton Clubman, together with the its associated cycles in the Rudge and Humber ranges, the Aero Clubman and the Beeston Clubman. These three replaced former sports models and were described briefly in our December issue, but since then certain important improvements have been introduced into the specifications which should make them even more popular. These include the fitting of light alloy (aluminium) wheels, handlebars, mudguards, and seat pillars which will not only considerably reduce the weight but will bring the models within the range of the discriminating club rider who is prepared to a pay a reasonable but not excessive price. Specifications of the three Clubman cycles are generous. The 22 in. frames are made of Reynolds 531 tubing with head and seat angles of 71 deg. Mudguard and pump fittings are brazed on and the mudguards are of light alloy with mudflap and spearpoint extensions. The 26 x 1 1/4" (597 mm) Dunlop light alloy road-racing rims are fitted with stainless steel spokes and Dunlop high pressure tyres. In production models, J.P. Britton celluloid mudguards and Dunlop Special lightweight steel Endrick pattern rims were fitted instead. The latest alloy fitments, Reynolds 531 lightweight tubing, pencil type stays, detachable chainwheels, and colourful "polychromatic" finishes and elaborate transfers (decals) made these among the most advanced and desirable sports machines of their era. Suitable for roadracing, touring or time trailing, they had 71° frame angles and optional Sturmey-Archer gears including the new four-speed FW, FM and FC types and GH6 dynohub. The price was £19. 12 s. 10 d. (single gear). 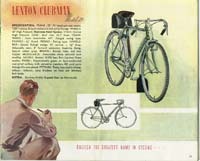 For the 1949 model year, introduced in November 1948, the Lenton Clubman was renamed Raleigh Clubman. The range was further refined with an attractive new handlebar stem. Most machines that year were fitted with Dunlop light alloy Westrick pattern 26 x 1 1/4" rims instead of the lightweight chromed steel of the initial production run. The specifications for the 1948-49 catalogue cited Dunlop light alloy Endrick rims with the option "if available", at the same price, of Dunlop stainless steel high pressure rims. At the time, British industry was ravaged by reoccurring shortages of materials so that the finished products often varied from the catalogue specifications. For example, alloy or stainless rims replaced chromed steel ones not simply because of their superior qualities but because of chronic chrome shortages. New that year were alloy shells for the Sturmey-Archer FC close-ratio four-speed and ASC fixed-gear three-speed hubs. The price for a Clubman rose to £22. 3 s. 8 d. (single gear). The one millionth Raleigh Industries export cycle since the war, a special gold-colored Raleigh Clubman, destined for New York for presentation to a leading Eagle Scout, was ceremoniously packed at the Raleigh depot at Brentford by G.R. Strauss, Minister of Supply, on 21 April 1949 and dispatched to Liverpool for shipment to America. Big changes in specification came in 1950. New 27 x 11/4" stainless steel rims (chromed steel was the specification in the North American catalogue), a tighter fame geometry (71° seat and 73° head), Reynolds 531 D pattern fork blades, chromed fork ends and rear triangle and Hiduminium GB Sports brakes with hooded alloy levers and larger 15/16th" handlebars ensured that the Clubman remained the finest production machine of its class in England if not the world, second only to the fabled, custom-made RRA (Raleigh Record Ace). Indeed, the new Clubman was, for most riders, preferable to the RRA on account of its price and, more importantly, availability, when a six-month to one year waitlist for the RRA was common. New colors that year were Flamboyant Electric Blue for Raleigh, Polychromatic Gold for Rudge and Polychromatic Lilac for Humber, all set off by white lining. The revised Clubman also benefited from the new range of alloy shell hub gears introduced in late 1949 by Sturmey-Archer. 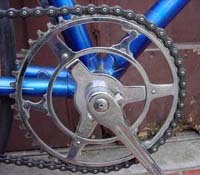 Supplied "stock" with flip-flop fixed and free single gear, any of the Sturmey-Archer hub gears could be fitted at extra cost including those made specifically for club riding (AM three-speed medium ratio or FM, four-speed medium ratio) or time trialing (AC three-speed close ratio or FC, four-speed close-ratio). Export machines to the United States came with hub gears as standard, the choice being limited to the AW (three-speed wide ratio), AM or FM, usually with steel shells. Interestingly, the characteristic wing nuts were also not standard "spec" in the USA either. 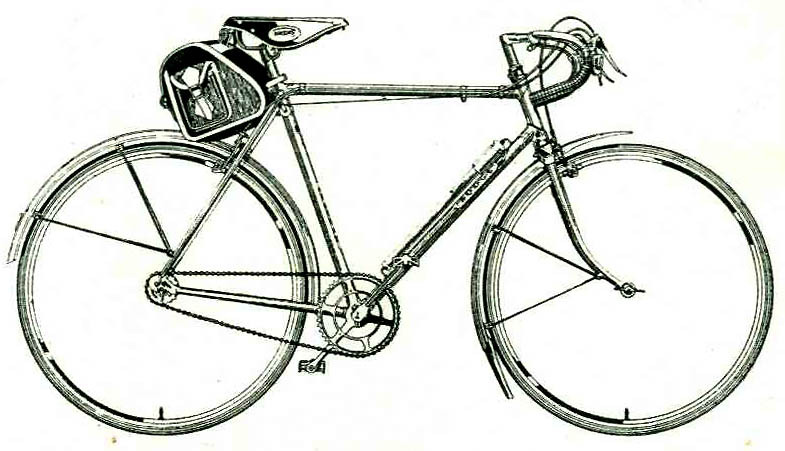 Now at its apogee, the Clubman remained in production for only two more years and in December 1951 it was announced that it would be discontinued in favour of the new Raleigh Super Lenton, Rudge Aero Special and Humber Streak which, unlike the Clubman, offered a choice of a 22" or 23" frame. Although not known at the time, these proved to be the last new club machines introduced by Raleigh as cycle sport begin to look more and more to the Continent for inspiration and technical innovation. In production for only four years, the Clubman range represented the final heyday of that most characteristic and classic British sports cycle. Those fortunate to own and ride these machines today can still relish the delights of the characteristic slow "click" of an AM hub, the creamy brittleness of Britannia celluloid mudguards and the warm glow of a fork-mounted DynoHub lamp on a late summer's eve. Mudguard and Pump Fittings. Mudguard and Pump Fittings. Mudguard and Pump Fittings and Pulley Boss. Polychromatic Olive Green with darker green head. Head lugs picked out in gold. Polychromatic Olive Green. No lining. Flamboyant Electric Blue. Chromed fork tips, rear seat and chain stay ends. White lining. 2030 steel Raleigh pattern. Taper round blades, solid ends. 2030 steel Raleigh pattern. Taper round blades, solid ends. Reynolds 531 tubing Raleigh pattern. "D" blades, solid steel ends. Special Raleigh design, 15" centres, 53/4" drop, 7/8th" dia. Alloy Sylvere Maes, 15" centres, 7/8th dia. Alloy Sylvere Maes, 15" centres. 15/16" dia. Adjustable stem, 2" forward extension, head-clip fixing, Adjustable stem, 2 1/2" forward extension, head-clip fixing. Adjustable stem, 2 1/2" forward extension, head-clip fixing. Special rubber grips. R.I. Rubber Sleeve Grips. R.I. Rubber Sleeve Grips. Front and rear caliper. Front and rear caliper. Light alloy calipers with hooded levers. 3-pin detachable. 46T flanged racing type. 3-pin detachable. 46T flanged racing type. 3-pin detachable. 46T flanged racing type. 6 1/2" fluted. 6 1/2" fluted. 6 1/2" fluted. Racing type. Racing type. Racing type. 66.4" free. 74.7" fixed. 66.4" free. 74.7" fixed. 66.0" and 77.6" fixed. 26" x 1 1/4" (597 mm) High Pressure, chromed, stainless steel spokes 26" x 1 1/4" (597 mm) Dunlop light alloy Endrick or Westrick rims, stainless steel spokes. 27" x 11/4" (630 mm) Stainless Steel high pressure, Bayliss Wiley Continental Hubs. Detachable White Celluloid with spearpoint extension and mudflap. Alloy stays. Detachable White Celluloid with spearpoint extension and mudflap. Alloy stays. Detachable White Celluloid with spearpoint extension and mudflap. Alloy stays. on head and left-hand fork blade on right hand fork blade. on right hand fork blade. 28 1/4 lb single-speed and 29 3/4 lb with Sturmey-Archer AM gear. single gear, 27 1/2 lbs., with Sturmey Archer FM gear, 291/4 lbs. single gear, 25 1/2 lbs. £21. 12 s. 11 d. incl. tax £21. 12 s. 11d. incl. tax. £26. 16 s. 6 d. incl. tax.